Well veganism is a bit more complicated than that, but the truth is that there are a lot of healthy, protein-packed meal ideas, so that even those who prefer to not eat animal products can build muscle mass and stay healthy and fit. Here are a few ideas of what to eat if you’re thinking of your vegan protein options. Since this is the meal that fuels your day- and who doesn’t want to start their day off feeling energized?- it’s normal to treat it very seriously. Among the staples of vegetarian diets are quinoa, oatmeal and peanut butter. You can mix these up as you wish, and there are a ton of ways to cook them. Quinoa is technically a grain, but it is packed with proteins! For each hundred grams of dry quinoa you get a whooping 14.1 grams of protein! All you need to do is give it a quick rinse under cold water, and then boil it for a few minutes. You can either use it as a rice substitute (fried rice, anyone?) or mix it with honey or dried fruit if you want a sweet treat! Ugh, now I’m hungry, and we just got started! This is another simple vegan protein source. It’s the kind of breakfast ingredient that you can turn into a hundred different ideas. You can have it either salty, by boiling it slightly with spices and eating it with grilled vegetables, or you can have the sweet version and mix in a banana, some chia seeds and a dash of cinnamon. For 100 grams of oatmeal you get 13.2 grams of vegan protein for your muscles to use. With either of these two you can mix in a few teaspoons of peanut butter for an extra decadent breakfast! You probably know about soy from all those soy milk lattes on Instagram. But did you know that green soybeans are not only delicious, but also full of vegan proteins? For each hundred grams of edamame (cause that’s what they’re called when they’re fresh and green), you would eat 13 grams of protein. Another protein rich product that’s excellent for those who need a vegan protein source is tofu. You can eat it as it is, grill it, mix it in salads, and pretty much use it just as you would use cheese. You can get 8.1 grams of protein from 100 grams of tofu. And if you make a tofu miso soup (miso paste having as much as 11.7 grams of protein), you will get a great meal, and also a bunch of protein. Did you know that spinach (which coincidentally is amazing in soups!) has almost 3 grams of protein per 100 grams of product? And if you ever feel the need to eat something that gets you full really quick, and also has more calories, you can try beans- any kind, pinto beans, black eyed beans, white beans. They’re all a very good source of vegan protein, having as much as 12 grams of protein a cup. And when you think about the fact that they are high in fiber and antioxidants, you realise that beans aren’t just good for your protein fix, but they’re amazing both for the waistline and your overall health! Did this article make you a bit hungry? (No? Just me?) 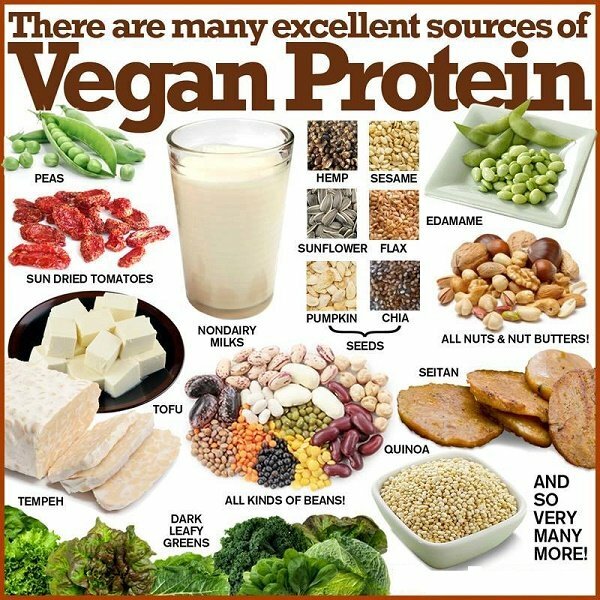 Let us know what other vegan protein sources you know of in the comments below.